I am extremely lucky in that I get to attend, and oftentimes speak, at a host of meetings in any given year. Some of them are technical in nature, some are not. For those meetings that are not, there are always a couple of presentations, panels, or even whole sessions devoted to ‘corporate culture’. What usually sets me off, and that typically results in a snarky tweet, is when someone speaks about culture as if it’s something you can directly manipulate. The five usual readers of this are rolling their eyes at this point, knowing how much I love to wallow in the pedant(ic) (a river somewhere, I’m sure). Again though, I’m going to exhort that the words have a meaning, and the meaning is powerful, so let’s use them correctly (as opposed to saying things that sound good, but have no real meaning, or cannot be used in a meaningful way). Culture is not something you can directly manipulate. It is a higher order effect that may change, as you alter something else. You can’t, in my opinion, speak about culture, or culture change, with any credibility, unless you actually speak about your role or work in manipulating the things that can (and ideally did) alter an organization’s culture. Which, in my mind, include but are not limited to: the people at your organization, the work they are doing, and how they interact with each other. All of these things will be a blend of intrinsic and extrinsic factors, coupled with tools and physical space. Changing these things will change culture. It’s also amazing if you can connect your intervention(s) to outcomes that cleanly demonstrate cultural change (and I acknowledge that this is very difficult). So, assuming you’ve made it this far, you’re likely asking yourself - where do Black Holes come into this, and what’s this about Employee Engagement? Well, Employee Engagement is just the same kind of higher order effect as culture. The same levers that influence culture, influence engagement. And, as for black holes - take a look at the following artistic impression, and then meet me below. See the stuff shooting out of the top? 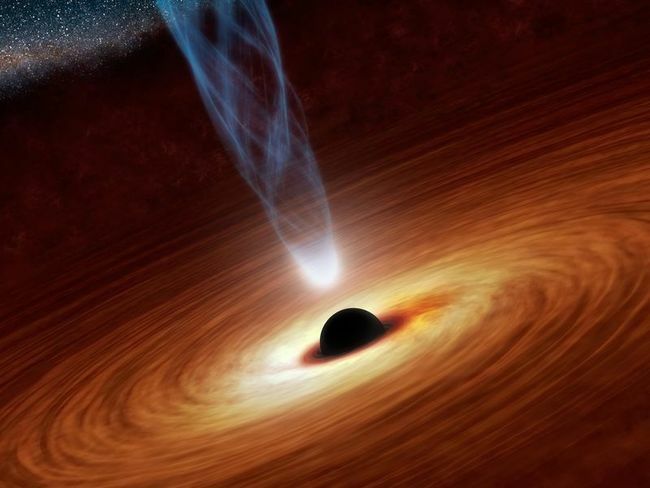 According to the press release: “Also shown is an outflowing jet of energetic particles, believed to be powered by the black hole’s spin.” The energetic particles are the higher order effect, and to change them, you’d need to do something to the interior processes of the gravitational event. Of course the analogy is not perfect, but the visual serves me as a remainder of the importance of focusing my energies (pun intended) on the correct lever(s) when making, and subsequently speaking, about change. Oh, and the connection to Lunch Roulette? It is such a lever for affecting cultural change … just wanted to throw that in there too. Let us know if you’d like to learn more.